Senior Melissa Newman is a Wittenberg recipient of a Fulbright research grant, and will be in Germany for 10 months starting in September. 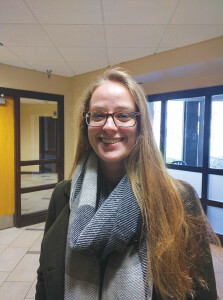 Newman, a history major with a German minor, first heard about the opportunity from her German professor, Timothy Bennett. There are two types of Fulbright scholarships: teaching English in other countries and a research grant. After Bennett suggested the research grant, Newman filled out the needed information, and was selected. With this grant, Newman intends to “focus on the ways of presenting history,” especially through studying the acceptance and allowance of “stolperstein” in various German cities. A stolperstein is a small golden cobblestone placed in the street in memory of a person who was killed in the Holocaust. The stone is put in the area in which the victim last lived, and there are over 50,000 stolperstein placed around 18 European countries. Newman encountered the memorials when she studied abroad in Germany during spring semester of her junior year. However, it seems that not everyone in Germany is on board with these memorials. Other large cities and small villages have also placed a ban on these stones being placed around town. Newman plans to study “on the ways of presenting history and how the stolpersteina bring a new element to the table with that,” but is open to let her ideas move as she further studies the way people remember history.